Patience… and believing in people’s ability to change and reform their lives, as well as holding onto the important value of relationships, are the qualities Lucas Teague says are essential to his role as Co-ordinator of Missing Link peer support service. “It’s about being present and there for the person,” says Lucas who brings 10 years’ experience as a support worker to the role. He insists that it was the quality of those relationships that helped people to turn their lives around. Missing Link, went live two years ago with 10 peer supporters on wards at Lambeth Hospital, supporting people over 12 weeks as they were discharged from hospital… a time when people are at their most vulnerable. Since then it has reached more than 1,300 people, both formally and informally. Lucas is inspired and impressed by the ability of the team. “They work with difficult situations and complex people and the success reaffirms the quality of lived experience. There’s rarely an emergency because of the high regard given to making people feel supported and this enables them to feel autonomous in making decisions in their work,” he says. Such is its success another cohort has gone through the eight-week training and have started working with the Community Options Team (COT) and Primary Care Support Service (Pass) as people face the transition from their community mental health team back to their GP. 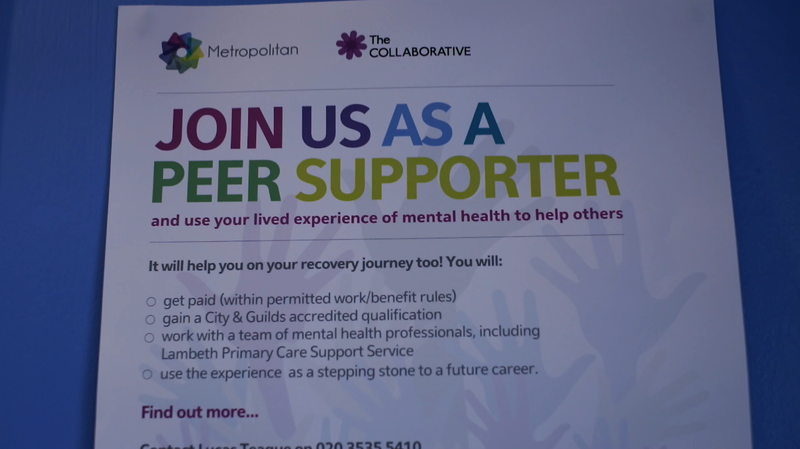 Lucas’ work is about communication: a balance between responding to the strategic needs of the Lambeth Collaborative (his post is hosted by Metropolitan) and personal needs of his peer supporters. As part of the Collaborative they have become significant players in an explosion of co-production, redesign and culture change. Their work is taking them beyond the original remit to work with the SWOT (Social Work and Occupational Therapy) team,supporting people to move on from residential care. They are also facilitating Tree of Life workshops – an innovative project to bridge the gap between clients and staff on wards – and are involved in a crisis house prototype. Some people aren’t ready for the level of engagement it takes to be part of a formal peer support project and that’s why access to informal peer support is part of the journey. “What’s required is that leap of faith, for some people it’s the first time that their lived experience has been seen as a quality and that can be a real revelation to people,” says Lucas. With peer support at an exciting point, what’s needed adds Lucas is “investment in infrastructure and ongoing employment opportunities within peer support”.